In early January, disastrous news had been sweeping through the global media: the tyrannical regime in North Korea had yet again revealed its true colours. North Korea’s former man number two Jang Song-taek was not only executed following a fast-track court but also subjected to a horrible medieval execution: he and his accomplices were thrown into an enclosure, where they were mauled by a pack of 120 ravenous dogs. Kim Jong-un personally attended the execution, and all the other top officials were forced to keep watching until there was not a single piece left of the victims. You can imagine the scale of the wave of repostings and thought-provoking discussions about the infernal nature of the regime, and I would not like to cite again the most odious examples, where people who did not know much about North Korea displayed their sincere emotions in response to this piece of news. However, there was an unexpected twist in this story not before long: the source of the news turned out to be a message from some Chinese Internet humorist’s microblog. And over the past several years, this is perhaps the most graphic example of a story where information about “Mordor in the North” proved to be an utter fantasy. As they say, a fairytale is a lie but with a hint in it, so the author would like to dedicate to this story a separate short study, in which he is going to talk about how the above news got from the Chinese microblog to the foreign press, as well as what this story tells us on the whole. It all started with one of the two Chinese microblogs which occupy the niche of Twitter in the Celestial Empire: Tencent Weibo and Sina Weibo, – and in one of them there is quite a famous Internet troll nicknamed Pyongyang Choi Seongho, posing as a genuine North Korean citizen and regularly posting his country’s news with a greater or lesser degree of grotesque. Here you should bear in mind that in modern China the attitude to North Korea is approximately the same as it was in the Soviet Union in its last stage. Yes, it is sort of our ally and a member of the socialist camp, but there are quite a few problems in the relations between the two countries, and the average inhabitant of the Chinese Internet seems to look at Pyongyang with a mixture of irony and certain irritation. Hence, same as in the Brezhnev period some of our intelligentsia subscribed to Korea Today as a replacement of the satirical magazine Krokodil, the PRC also has people who are ironical about the situation in the country of juche. Who stands behind the account is unknown, but Choi writes in Chinese, of course, and the above picture posted in his blog at least raises doubts that we deal here with a genuine North Korean. However, the microblog does not only dwell on the North Korean theme. This author markedly stands out among the other Chinese Internet scoffers due to his literary and satirical talent. But alongside Choi from Sina Weibo, there is his double on Tencent Weibo, and it is not clear whether it is the same person or his imitator: the “real” Choi has about two million subscribers, and his “duplicate” has about 30 thousand of them. It was the “alternative” Choi who posted, on 11 December, to his “choiseongho000” Tencent Weibo account a message ( it has now been removed but can surface somewhere in the cache) stating that Jang Song-taek along with his five accomplices “were stripped naked and thrown into a metal cage; then 120 Northeastern hounds, starved for three days, were let in. The dogs were allowed to prey on them until they were completely eaten up. The entire process lasted for one hour, with Kim Jong-un, Ri Sol-ju and 300 North Korean senior officials watching it”. The posting has been viewed 290,000 times, but the author of the present article does not believe that there is more to this posting than just a desire to have a good laugh. It is possible that Choi’s posting is built on what the Western humour tradition calls Russian Reversal – in the South people eat dogs, and in the North dogs eat people. It is possible that Choi had been influenced by the scenes from the Korean Central News Agency (KCNA) where an effigy of the “traitor” and ex-president Lee Myung-bak is not only stabbed with bayonets but also mauled by specially trained dogs. The next stage was a publication in the Hong Kong newspaper Wen Wei Po. We do not know though whether it was published in the paper edition as well. Here again we should not forget that though Hong Kong is part of China, it is not China as such, and they have their own rules regarding what can and what cannot be written in the moderate yellow press. The term “moderate yellow” is quite appropriate here because, even in the opinion of Western authors, out of Hong Kong’s 21 major newspapers, Wen Wei Po ranks 19th or even last for non-yellowness and credibility. On the whole, Wen Wei Po has been believed to be a pro-Beijing newspaper, but we are not talking here of its close ties with mainland China. It most likely maintains ties with the pro-Beijing forces in Hong Kong itself, but on the whole it is independent and definitely is not the mouthpiece of the Communist Party of China (CPC). It is also worth mentioning that there are two Chinese newspapers of this name: one is in Hong Kong, and the other – in Shanghai. And whilst the Hong Kong newspaper is, to a certain extent, a tabloid, the Shanghai one is quite a reputable outlet. If you just mention a Chinese newspaper of this name, the Asian reader will probably think about the Shanghai edition and not its Hong Kong counterpart. This, possibly, played a crucial role in the subsequent legitimisation of the above piece of news. The article could be roughly translated as follows: there are rumours that in North Korea Jang Song-taek has been subjected to an “execution by dogs”. After Jang Song-taek was arrested by Kim Jong-chol, who had personally led the guards team, the former was executed on the 5th day of the month. Jang Song-taek’s five closest aides were executed alongside him. Whereas previously machine-guns and small-calibre canon were used for executing political criminals, this time an “execution by dogs” was applied1. This was followed by a full copy of the above-quoted posting by Pyongyang Choi Seongho, but without reference to the source of the information. That is, simply “there are reports”, but we are not told who is reporting – maybe Choi, maybe someone else. By the way, the article did not provide the author’s name. A careful reader could also notice that, according to the news, the “execution by dogs” took place on 5 December, that is, prior to the meeting of the Central Committee of the Workers’ Party of Korea (WPK) held on 8 December 2013, where Kim Jong-un’s uncle was solemnly condemned and arrested. Actually, a similar system of aggregating news is quite frequent in the foreign media as well. At first “something weird” is posted by some unknown blogger, then the news is reposted by another blogger who is much more popular, then some yellow newspaper which holds its finger on the pulse of the blogosphere and collects news in this way publishes this piece of news and at best makes a reference that such and such famous blogger has written that… After that, some serious outlet borrows information from the yellow newspaper making a reference to it, and this piece of news starts travelling from one resource to another of similar weight. This time, the article was authored by Ching Cheong (程翔), a senior writer with The Straits Times. His biography is not that straightforward – for example, in April 2005, he was detained in the territory of the PRC, sentenced to five years of imprisonment on allegations of spying for Taiwan and released under the pressure of international protests in February 2008. From 1974 to 1989, he worked in the above-mentioned Wen Wei Po and left it after the Tiananmen Square events. To put it mildly, he is a peculiar person, and it’s thanks to his efforts that the Hong Kong tabloid, which might not even have censors, has turned into a government newspaper which has totally different perceptions of censorship indeed. The “wise” conclusion that by publishing an article about the dogs Beijing expressed its displeasure with what was happening in the DPRK also belongs to him: the Hong Kong newspaper gave up the role of Beijing’s mouthpiece long ago, and the PRC has enough official press to express displeasure with North Korea if there is any. When the DPRK conducted its third nuclear test despite China’s objections, there were some quite critical articles in Chinese newspapers. After a short break for Christmas holidays, all other publications that felt like it started reprinting the English-language piece of news - The London Evening Standard, The Daily Mail, The New York Daily News and NBC News. The Russian press also touched the sensationalist news, which acquired additional details. For example, it occurred to someone that supposedly “feeding people to dogs is a terrible medieval execution which had been revived specifically for such a solemn occasion”. One of our tabloids even picked up, on a serious note, the canard of the Russian bloggers that the dogs that had eaten Jang Song-taek were later on cooked for the young general, who thus also ate his relative. The Northerners remained proudly silent following the tradition, so a number of “experts” got convinced that what had been written was true: if North Korea is a state of evil, surely they can execute people like that. The experts’ conclusions were based on the overall image of North Korea, as well as on those videos in which dogs were tearing apart the effigy of Lee Myung-bak and Kim Kwan-jin. But there were sceptics as well. BBC News and The Washington Post did not let the news of the execution go unnoticed either, but they commented on it with a hefty dose of scepticism: these outlets quoted human rights advocates who insisted that feeding those on a death row to dogs is a bit over the top even by North Korean standards. If I remember correctly, the first one was Max Fisher who, by the way, back then was one of those who voiced the news about the DPRK and their interest in Hitler. At the time, he merely expressed cautious scepticism, but in this case he subjected the news to rigorous examination. Fisher pointed out a number of oddities which were later on voiced by other journalist and analysts as well. First, let’s consider the source of the information. There is no talk of the government media, and the Wen Wei Po article does not indicate where it was sourced. Second, the remainder of the Chinese media did not pick up on this news and was sticking to the story of execution by firing squad. Third, South Korea’s media did not touch the story either in spite of the fact that they very often publish some obvious canards or sensationalist news with reference to anonymous or questionable sources. 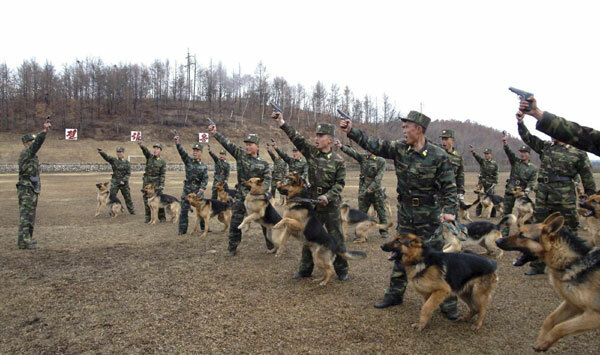 If there had really been discussions about the execution by dogs, this rumour would have surely been mentioned by different organisations, especially those ones that claim having a network of informers in the DPRK. Fourth, this story had been around for a long time and nobody had tried to confirm its plausibility. Normally, an event leaves behind an information trace and gets confirmed by several sources. Here, as has been said above, no new data from any other sources ever surfaced. The mass media were sticking to the story that Jang had been killed by a machine-gun or in better cases clarifying that it had been an anti-aircraft gun. 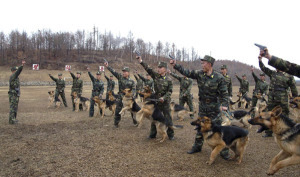 Then experts pointed out that in terms of carrying out executions the DPRK is not that sophisticated, whereas the painted picture brings about the atmosphere of the James Bond films, where the bad guy would normally push his non-loyal allies into a swimming pool with crocodiles or, in this case, into an enclosure with dogs. By the way, who is that clever guy who had counted them so accurately? Indeed, although the DPRK does have repressions on a massive scale as well as public executions and harsh conditions in prisons, you come across information about medieval torture only in the propaganda by Korean anti-communist protesters, and executions are either by firing squad or by hanging (with the latter being applied only to prisoners in camps. The tabloid was traced back quickly, but then computer expert and blogger Trevor Powell, of Chicago, went further and became the first person who had traced the information further and noted that the experts were still missing the point that the newspaper’s source of the information had been a tweet of a well-known satirist or one of his imitators. In the meantime, on 7 January, after the satirist’s role in this whole “story about the dogs” had been revealed, the post on Tenсent Weibо was deleted (it is unclear whether it was done by the author himself, the service administrators or the Chinese authorities). The “main” one posted to his account a version of Jang Song-taek’s execution in the form of a picture showing a firing squad and claimed that the joker of the same name from the other resource was a cheat stealing his content. You would have thought that the news that the story about the dogs had been launched by a Chinese troll received a wide coverage, and it was perhaps the first time that nearly all news agencies had paid some attention to refutations, with some of them even having tried to publish some analytical material in this regard. But you can’t erase this type of hot news from public mind just like that, particularly if they are far too “tasty” in terms of their use in anti-North-Korean propaganda. Therefore, look carefully through the recent news regarding Jang Song-taek’s execution and pay attention to who and how adds to the official information “according to other sources, Jang was thrown into an enclosure”. There were a lot of people who believed the satirical canard, with some of them being quite serious and reputable experts for whom this level of grotesque had turned out to correspond to their own perception of what might be happening in North Korea. And, actually, not many of them traced back the entire way of the evolution of the news. There are a few reasons for that. First, it is North Korea’s overall image created based on both its real actions and as a result of the wide demonization campaign, hence any news of a corresponding nature will not be faced with criticism. As noted by The Telegraph journalist Tim Stanley, the North Korea regime is so mad and gruesome that “it’s difficult not to believe whatever tall story you hear about it”, even if it is the news that the Korean People’s Army (KPA) uses kittens for target practice. American journalist Isaac Stone Fish at Foreign Policy Magazine has even formulated a jokey rule of his name. According to his rule, American journalists can write about North Korea whatever they like and it will be believed. Second, it’s a strong appetite for “hot, sensationalist news”. As has been pointed out by Chad O’Carroll, the head of the independent English-language resource nknews.org, stories about the DPRK usually generate a lot of attention, hence it is easy to understand why editors like them; they can publish unreliable and sensationalist information because they can always take the stance: “How can we check that? The DPRK is such a closed country…”. An editor has another unpleasant choice – you can wrap up a “tasty” story because you sense that there is a trap, but senses can’t prove much. Still what if the story turns out to be true? Third, on top of that there are general peculiarities of modern information society. Even 10-20 years ago, a situation like that would have been impossible. None of the respectable media would have used a humorous article as a source. But with the advent of the Internet, it has become so much easier to obtain information and, at the same time, so much more difficult to verify its plausibility. It happens so frequently that, after a series of consecutive repostings, the original source of the information becomes almost unverifiable, and the news itself may acquire additional details like in children’s broken telephone game. It becomes so much more difficult to unwind the ball of yarn to the end. You could add to that a certain degree of laziness explained by both the unwillingness to deal with foreign-language sources and the reluctance to look for the verification of something that seems obvious due to prevailing discourse. Russian researcher A. Lankov raises some questions that are even more serious: if a mere joke had such an effect, “What about those situations when a blogger knowingly publishes false information? In old, pre-Internet times, a source knowingly providing false information to journalists perhaps would not have been taken seriously anymore and thus would have lost the opportunity to disseminate misleading information. In our time of Internet anonymity, a blogger is not really risking his or her reputation: they can always change the nick after all”. Dear readers, when you hear next time some heartbreaking news about North Korea, Russia, Holland, America or Iran, please remember this story. And let it be for many a lesson and a warning of how easily you can mess it all up when you are too trusting. Here we have a clear-cut example of how easily even the most odious news can be blindly accepted if the audience is willing to believe it; and that in the modern world it is enough to have just two or three unethical journalists for some story that has nothing to do with the reality to get legalised after a while and make a stir in the international community. However, it is not that hard really not to find yourself among the hamsters: all you need to do is verify sensationalist material and start acting on it only if it corresponds to the reality. Konstantin Asmolov, Candidate of Historical Sciences, senior research fellow at the Centre for Korean Studies, Institute of the Far East RAS – exclusively for the online magazine “New Eastern Outlook”.